The last few years this little elf doll that is now known as “Elf on a Shelf” has been in just about every store and someone is making BIG bucks for the book they created and put with this horrible creation. To me, it is a thing that nightmares are made of; from Thanksgiving till Christmas this little elf moved from room to room and even when he couldn’t be seen, the jingle bell on his cap would ring to let you know that he was nearby. Mommy Dearest had decided that the best way to get her somewhat willful child to behave, at least between Thanksgiving and Christmas, was to have this elf doll move into our house. Our elf had a jingle bell on his cap and so was named Jingle; he reported all bad behavior directly to Santa. I feared him the first year and hated him till he disappeared sometime around 4th grade. I remember the first year that he appeared, I was in kindergarten and couldn’t wait for Thanksgiving because that meant going to Grammy’s and seeing all my cousins and playing in the snow, snow forts, snow ball fights, sledding, hot chocolate and sleeping in a sleeping bag. We came home on Saturday and that was when Jingle appeared. I woke up on Sunday and he was sitting next to my cereal bowl. I thought that he was a cute little doll and started to play with him instead of eating my breakfast. Of course that got me a little verbal correction and then Mommy Dearest launched into the tale of “Jingle”, who was Santa’s helper, and suddenly my little shadow. Even when I couldn’t see Jingle, if I did something wrong I would hear his little bell and was swiftly told that he was reporting my bad behavior to Santa and with any luck I would at least get a candy cane in my stocking instead of a lump of coal. My older siblings took advantage of the fact that they were tall enough to reach the place where Mommy Dearest had hidden his bell and if I didn’t obey one of their commands or wouldn’t do exactly as they said I would hear Jingle’s bell and I just knew that he was reporting me directly to Santa. The appearance of the little elf had me frequently looking over my shoulder and constantly trying to be good; which for a little kid isn’t always the easiest thing to do. Christmas time means Christmas cookies; cut-out iced ones, Russian tea cakes, date bars and gingerbread men. My sweet tooth is well known in my family so it was a constant internal battle with myself to stay out of the cookie tins. I would constantly get in trouble for sneaking cookies, especially when I thought that no one was looking. One night, or should I say early morning, I popped out of the bed that I shared with my oldest sister when she came home from college and quietly snuck into the kitchen to get a cookie or two to munch. I no sooner had the lid off the cookie tin and had taken a hearty bite of a very delicious iced snowman with sprinkles than I heard that bell. I froze! Didn’t that elf ever sleep??? I quickly brushed the crumbs off of my face and hands and headed back to bed. Busted by Jingle!! The next morning Jingle was once again sitting by my cereal bowl. I stared at him and wondered how something that looked like a doll could actually talk to Santa. When I was done I took my bowl to the sink and when I came back Jingle was off the table and sitting at my father’s desk. I was a firm believer that he was really able to move about on his own and had no doubt that the little rat fink could actually report to Santa. Fast forward many years later when Mommy Dearest decided that Jingle was no longer working to make me behave for a few weeks of the year and he was gone, never to be seen again. 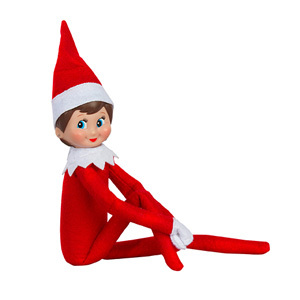 Jingle never visited my children and when “Elf on a Shelf” started appearing in stores as a “cute” thing at Christmas, I could hardly believe that someone would want to make a profit on something that was a terror to small children. Much later they made a movie about a horrible doll named Chucky who could walk around and was known for killing people with his knife. Part of me thought that he was really Jingle’s evil big brother and I never could watch the movies. 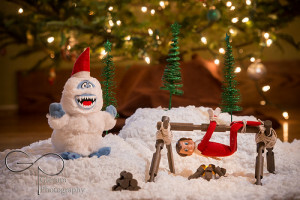 This entry was posted in Uncategorized and tagged christmas, Elf on the Shelf, evil little doll by Country Bumpkin. Bookmark the permalink.